Dacia to launch in UK in 2012 | What Car? Renault has confirmed that its Dacia budget brand will launch in the UK at the end of 2012. Renault had previously planned to launch Dacia in the UK in 2008, but postponed this due to demand for the cars in other European markets. Renault Chief Executive Patrick Plata made the announcement at the Geneva motor show, telling What Car? that the time was now right for Dacia to come to the UK. 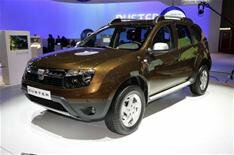 First to arrive will be right-hand drive versions of the new Dacia Duster SUV, launched at the Geneva show. Like all Dacias, value for money is key, with the Duster offering plenty of space and equipment for the money - at over 4300mm long and with a boot capacity ranging from 474 to 1636 litres, it's a similar size to the Hyundai ix35 and Nissan Qashqai. Three Renault-sourced engines are available on the Euro-spec Duster: a 105bhp 1.6-litre petrol and two 1.5-litre dCi diesels with 86bhp and 107bhp. Emissions should be reasonable with the diesel engines starting from 135g/km of CO2 for the two-wheel drive dCi diesel to 145g/km for the four-wheel-drive car with the same engine. Prices for the two-wheel-drive version start at 11,900 in Europe (around 10,800), while the four-wheel-drive car costs from 13,900 (12,600). More Dacias will arrive in the UK in 2013 with hatch and estate versions of the next generation of Logan. The current Logan costs from 7300 (around 6600) in Europe. All Logans will come with three-year warranties and it's expected that Dacia's 'no haggle' policy will also find its way to the UK. Dacia dealers work on tight margins, leaving no room for discounts. With demand for the cars strong right across Europe, Renault says it doesn't have to give such incentives. The cars will be sold through existing Renault dealers, but in a bespoke area of the showroom. However, Plata did not rule out stand-alone Dacia dealerships 'if numbers allowed'.